An old man has shot the ultimate mythical creature and says they need to be wiped out before more humans are in danger. Up at the Tanner's Reach cabin, an excited old man and a very familiar young woman come towards John. The old man says he's shot a sasquatch that was going to eat his dog. John doesn't believe him because they're made up (although he's seen plenty of strange things lately) but the man insists they are real and that one tried to eat a little girl at Manzanita Post. John begins to believe the old man and his serious face. The crazed old timer tells John to kill them all and fires his gun into the woods with the young woman hiding behind him. John walks off. You are told to find and kill six sasquatches. Head out into the areas of Tall Trees marked on the map which appear one at a time. Locate the sasquatch in that area and take it out. Aim for the head but sometimes it may take two shots. After it is dead move on to the next marked area. You'll end up near the entrance to Cochinay before heading back down towards the river below. 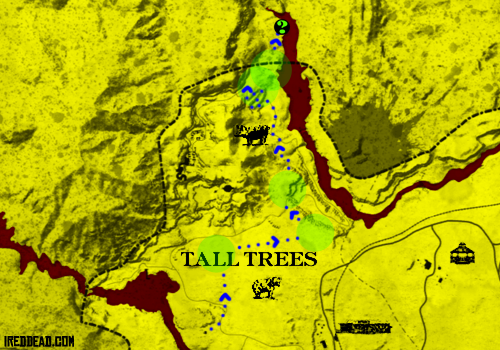 The final area is out past the original borders of the Red Dead Redemption map. The sasquatch is sitting next to a tree. A cutscene shows the sasquatch crying. When John approaches it tells him to shoot. John says it will be his pleasure to stop him from eating more babies. The sasquatch gets up in anger and tries to dispel the myth that they eat babies. The sasquatch goes on to say that they are being murdered by some maniac and he is the last sasquatch after being in these hills for thousands of years. John insists he eats babies and the sasquatch gives up. His family and kind are all dead so he might as well join them. He sits down again and begs John to make it stop. The mission is now complete. You can either kill the sasquatch or let it be and walk away. Simply find the sasquatch in the marked area and kill it. Enter the area slowly and look around. They can be anywhere in that area. The second one is usually near the cliffs. If you shoot but don't kill them they will run away. You do not need to kill the last sasquatch. The mission completes after the cutscene.